People without regular homes, people interested in recycling, re-using the surplus of the food industry, eating wild plants and other critical practices. And people who aim to get a deeper understanding of what it means to live in the fringes of society, both in the Netherlands and the US and Brazil. Handboek of de Stadswildernis was published by the Dutch Art Institute in 2011 as part of DAI Publications. The book was produced in close collaboration with Werkplaats Typografie in Arnhem and the designer Noah Venezia. Distributed by several book stores like 'De Rooie Rat' in Utrecht, 'Fort van Sjakoo' in Amsterdam and 'Printroom' in Rotterdam as well as by Doris Denekamp through her website. 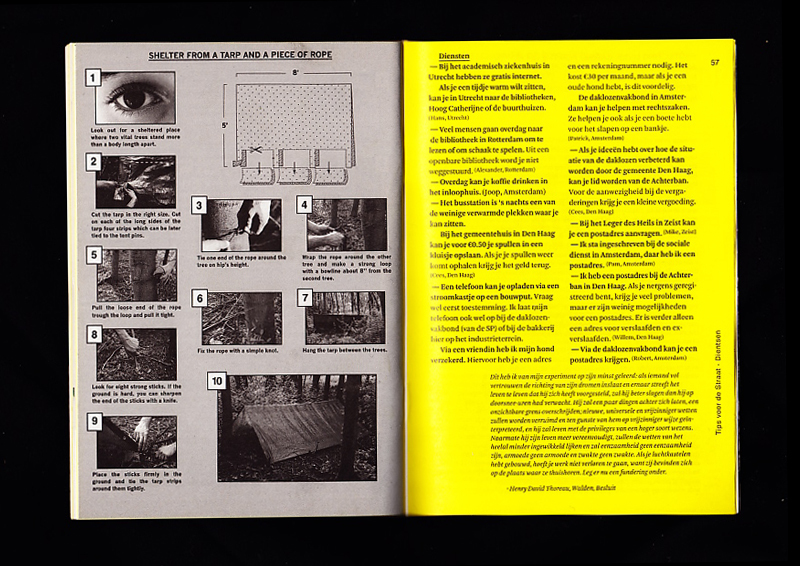 Handboek voor de Stadswildernis is a pocket-sized guide for survival in the fringes of Dutch cities. The handbook contains the sections Sleeping and Shelter, Food, Equipment, Clothing, Washing, Sickness and Emergencies and Services - all with tips and tricks based on the experience of homeless people in the Netherlands. The middle section of the book contains a small guide for edible city weeds, consisting of colored scans of different weeds and a short description of the plant, the location where it can be found and how it should be cooked. The idea for the handbook came from the American zines 'Dwelling Portably' by Bert and Holly Davis. The Davises live off the grid in the woods of Oregon and publish a small zine in which they collect practical information on a wide variety of subjects like recycling, building your own home, lifting a bicycle over a fence, eating wild plants, fixing tarps and preserving food. Tips that come both from their own experience as from other people in the US and around the world that live their lives without a regular home. The information in Handboek voor de Stadswildernis is based on a series of interviews with people without a home in the bigger cities in the Netherlands. Most of these people, contrary to Bert and Holly Davis, did not choose to live in the fringes of society, but nonetheless developed similar strategies for survival. Through their practices of recycling, reclaiming the surplus of the food industry and their use of local, informal economies, they are developing useful alternatives for our society of waste. The initiators have met most of the interviewed people through the homeless peoples' newspapers. These newspapers are both sold and partly produced by people without regular homes. 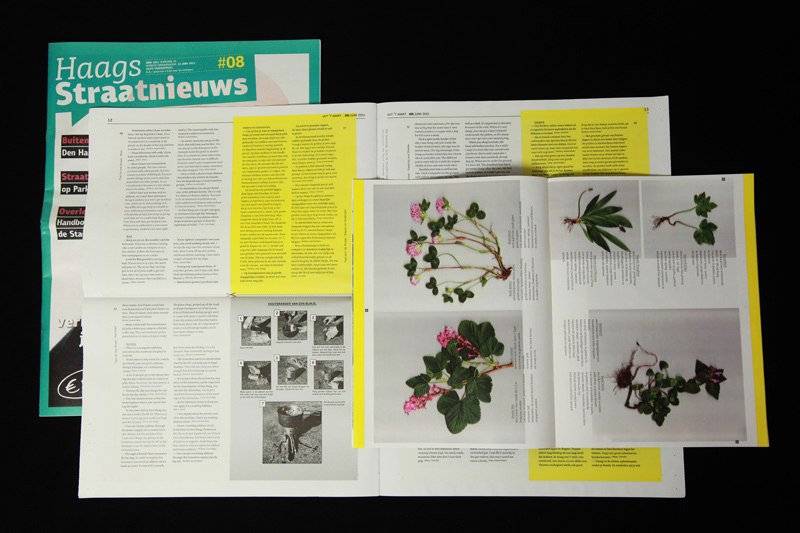 The spreads of the Hanboek voor de Stadswildernis are printed in the different newspapers of Den Haag, Utrecht and Amsterdam. The readers of these newspapers could take the spreads out and construct their own handbook. The artists have also produced a edition of 700 books with a cover. In these books you can still recognize the three newspapers in the different kinds of paper. The last section of the Handboek voor de Stadswildernis consists of a short essay by Brazilian professor Maria Cecilia Loschiavo, who writes about the recyclable material collectors in Sao Paulo and their important role in the emancipation of Brazilian society. The goals of Handboek voor de Stadswildernis is first of all to validate and distribute the useful, critical and remarkable knowledge of people living without a regular home. The tips and tricks are useful to other people living in similar situations as well as for people looking for critical practices that can formulate alternatives for the dominant way of living and use of resources. Apart from that the Handbook tries to investigate the possibility of a life off the grid in the densely populated area of the Netherlands. Knowledge of some people living without a regular home is collected and distributed. The artists hope this contributes to a validation of the often critical practices of people living in the fringes of society, people that often have no, or a very marginalized voice. Although the complete handbook with cover did not have a huge print run, the information was widely distributed through the different homeless peoples' newspapers. In this way people can really use the tips and tricks in their daily lives.